Photograph of Jean Piaget at the University of Michigan campus in Ann Arbor, 1967 or 1968. Jean Piaget (August 9, 1896 – September 16, 1980) is considered the developmental psychologist of the twentieth century. He preferred the title "genetic epistemologist" - researching the origins (genesis) of knowledge (epistemology). Piaget's discovery that intellectual development proceeds in an orderly fashion through a sequence of identifiable stages, in a way similar to physical growth, revolutionized our view of the child's mind. This has had significant repercussions in the educational arena, including regarding children as "creators" of their own knowledge, rather than as small, ignorant adults in need of training. The impact of his work has extended beyond psychology and education into philosophy, sociology, and even computer science. However, despite his groundbreaking discoveries, Piaget's work is lacking in several areas, notably the importance of love, emotion, relationships with others, and spiritual values in our thinking. Thus it should be considered a pioneering, yet incomplete, account of human cognitive development. Piaget was born in Neuchâtel, in the French-speaking part of Switzerland. His father, Arthur, was a professor of medieval literature at the University of Neuchâtel. Jean was a precocious child, and began his long scientific career in 1907 at the age of ten, with the publication of a short paper on his observations of an albino sparrow. His reason for publishing this observation was to show the curator of the Neuchâtel Museum of Natural Sciences that he was active in the field, so that he might be given permission to work at the museum outside regular hours. Throughout his school years, Piaget developed his interest in biology, particularly mollusks, publishing several papers in professional journals. He became well-known among European zoologists, to the point of being offered a position as curator of a mollusk exhibition, which he had to turn down in order to complete high school. Piaget experienced two intellectual "crises" during his adolescence. The first, as he put it, was "the problem of religion." His mother, a devout Protestant, enrolled him in a course of religious instruction. There, he found difficulty in reconciling certain religious dogmas with biology, and was surprised by the frailty of the proofs of God's existence, although at that time he in no way denied the existence of God. In his father's library he came across a work by August Sabatier entitled Outlines of a Philosophy of Religion Based on Psychology and History, and was delighted with the notion of "evolution of dogmas." This sparked in him a passion for philosophy. The second "crisis" occurred when his godfather introduced him to the "creative evolution" of Henri Bergson. This was the first time Piaget had heard philosophy discussed by anyone who was not a theologian. It was both an emotional and intellectual shock: "I recall one evening of profound revelation. The identification of God with life itself was an idea that stirred me almost to ecstasy because it now enabled me to see in biology the explanation of all things and of the mind itself" (Evans, p. 111). Thus, Piaget came to see the epistemological problem (the problem of knowing) in a new light, and decided to dedicate his life to the biological explanation of knowledge. He received a Ph.D. in natural science from the University of Neuchâtel in 1918. During this time, he published two philosophical essays entitled "La Mission de l'Idée" (“The Mission of the Idea”) and "Recherche" (“The Quest”), which showed the direction of his thought. Recognizing the need for something other than philosophy, namely psychology, in his quest, Piaget then studied briefly at the University of Zürich under such prominent psychologists as Carl Jung. His interest in psychoanalysis can be dated to this period. Adult: Does the moon move or not? Child (age 7): When we go, it goes. Adult: What makes it move? Child: When we walk. It goes by itself. At this point Piaget formed his plan: first, he would study children's thinking and intelligence as they emerged in the first few years of life; then, he would construct a theory of structures of intelligence; and finally, he would be able to formulate a psychological and biological epistemology. In 1921, he returned to Switzerland as director of the Rousseau Institute in Geneva, and in 1923, he married Valentine Châtenay. They had three children, Jacqueline, Lucienne, and Laurent, whose development he studied from infancy. Over the next six decades he succeeded in accomplishing his plan. Piaget's research was focused on the goal of discovering how knowledge develops. He viewed children as little philosophers and scientists building their own individual theories of knowledge based on logical structures that develop over time and through experience. Thus, children of different ages view the world in entirely different ways from adults. Piaget is best known for organizing cognitive development into a series of stages—the levels of development corresponding to infancy, early childhood, later childhood, and adolescence. These four stages are called the Sensorimotor stage, which occurs from birth to age two (children experience through their senses), the Preoperational stage, which occurs from ages two to seven (motor skills are acquired), the Concrete Operational stage, which occurs from ages seven to eleven (children think logically about concrete events), and the Formal Operational stage, which occurs after age eleven (abstract reasoning is developed here). Advancement through these levels occurs through the interaction of biological factors and experience; through a mechanism he called "equilibration." He believed that children (and indeed adults) are continually generating theories about the external world (which are kept or dismissed depending on whether we see them working in practice). Bust of Jean Piaget in Parc des Bastions in Geneva, Switzerland. During his long academic career, which spanned over seven decades, Piaget wrote more than sixty books and several hundred articles. In 1969, he became the first European to be awarded the American Psychological Association (APA) Distinguished Scientific Contribution Award. In 1972, he was awarded the Erasmus Prize, an annual award given by the Praemium Erasmianum Foundation to individuals or institutions that have made notable contributions to European culture, society, or social science. His theory of cognitive development has proved influential throughout developmental psychology, notably on the work of Lev Vygotsky, Jerome Bruner, Lawrence Kohlberg, and James Fowler. His influence spread from psychology to philosophy and beyond. The philosopher Thomas Kuhn credited Piaget's work in helping him understanding the transition between modes of thought that characterized his theory of paradigm shifts. The philosopher and sociologist Jürgen Habermas incorporated Piagetian thinking into his work, most notably in The Theory of Communicative Action. Piaget had a considerable impact in the field of computer science and artificial intelligence. Seymour Papert used Piaget's work while developing the Logo programming language and his theories influenced the creation of graphical user interfaces. Piaget has also had a substantial impact on approaches to education. His discovery of stages in children's thinking changed our view of education from simply imparting knowledge to guiding children in age-appropriate ways as they learn about their world. In Conversations with Jean Piaget, he says: "Education, for most people, means trying to lead the child to resemble the typical adult of his society…. But for me, education means making creators….You have to make inventors, innovators, not conformists" (Bringuier, p.132). Critics of Piaget's work have noted that the final stage of intellectual development, that of Formal Operations, although beginning around the age of 11, involves abstract inferential thought that is beyond the comprehension of many adults. Piaget agreed that people may not reach the level of formal operations in all aspects of their thinking, while maintaining that they do so in their particular area of expertise (Evans, p.27). This final stage of cognitive development is devoid of the emotional and spiritual content that is found in people's thinking. In fact, it more closely describes the processes of a computer or artificial intelligence than a human being. Piaget has commented that emotion, or affectivity, is "basic as a motive for action…but it's only a motive, and it isn't the source of the structures of knowledge" (Bringuier, p.86). Piaget himself had no interest in studying individual differences, and regarding motive as merely individual interest, he did not pursue this area. However, it may be the case that the essential characteristics of human nature, those which distinguish us from other creatures, may be found not only in our intellectual abilities but in our motivations for acquiring knowledge. Finally, Piaget's theory provides no basis for a satisfactory model of the development of adult thinking, since the stage of Formal Operational thinking surpasses the intellectual development of many adults. Yet, Piaget believed that people continue to construct their knowledge of the world as they experience it. Also, Piaget undervalued the role of adults in the development of children's knowledge and thinking. While he cannot be criticized for recognizing the importance of the child as an active participant in the development of their own knowledge, he gave little or no credit to the influence of adults and to the ways in which children learn from their parents, teachers, and others. The crises of faith in Piaget's adolescence led to a shift away from belief in the transcendent, personal God who created the world and set its rules of existence. His 1928 publication entitled, Two Types of Religious Attitude: Immanence and Transcendence, sheds light on this change. Here, he argued that recognition of divine immanence, in which God is found within the person in the form of thought or consciousness, should be regarded as more evolved than belief in a transcendent God. Moving to a belief in divine immanence resolved Piaget's dilemma regarding the relationship between faith and science, allowing him to proceed in his quest for a biological explanation of the development of knowledge. However, the loss of belief in a personal God may have contributed to his limited understanding of the purpose of human life, or God's ideal of creation, and so resulted in the failure of his theory, and those subsequently building upon his work, to grasp the importance of love, human relationships, and spirituality in human development. 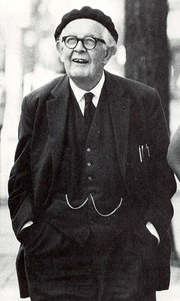 It has also been suggested that Piaget may have deliberately obscured his religious beliefs in order to have his work received by the scholarly community of scientists and psychologists committed to atheistic assumptions (Dale, 2014). In support of this argument, Piaget wrote in his autobiography (1952) that he had expected his psychological research to be concluded in a matter of five years, whereupon he would return to complete his work in developing genetic epistemology. It is within this larger framework that his religious, even mystical, understandings could have been more prominent as he sought to chart the development of not only cognitive knowledge but also moral and spiritual values in human beings. Bringuier, Jean-Claude, Conversations with Jean Piaget. Chicago: University of Chicago Press, 1980. Piaget, Jean. 1928. Judgment and Reasoning in the Child. London: Routledge & Kegan Paul. Piaget, Jean. 1932. The Moral Judgment of the Child. London: Routledge & Kegan Paul. Piaget, Jean. 1951. Play, Dreams and Imitation in Childhood. London: Heinemann. Piaget, Jean. 1952. Origins of Intelligence in Children. New York: International Universities Press. Piaget, Jean. 1952. "Jean Piaget (Autobiography)." In E. G. Boring (ed. ), A History of Psychology in Autobiography, Vol. 4. Worcester MA: Clark University Press, 237-256. Piaget, Jean. 1954. Construction of Reality in the Child. New York: Basic Books. Inhelder, Bärbel, and Jean Piaget. 1958. The Growth of Logical Thinking from Childhood to Adolescence. New York: Basic Books. Piaget, Jean. 1970. Structuralism. New York: Harper & Row. Piaget, Jean. 1971. Biology and Knowledge. Chicago: University of Chicago Press. Piaget, Jean. 1983. "Piaget's Theory." In P. Mussen (ed. ), Handbook of Child Psychology, 4th edition, Vol. 1. New York: Wiley. Piaget, Jean. 1995. Sociological Studies. London: Routledge. Piaget, Jean. 2000. Commentary on Vygotsky. New Ideas in Psychology 18, 241-59. Piaget, Jean. 2001. Studies in Reflecting Abstraction. Hove, UK: Psychology Press. Jean Piaget Archives, a private foundation at the University of Geneva. Jean Piaget Society—Society for the Study of Knowledge and Development (USA). Time 100: Jean Piaget: Time Magazine's 100 Most Important People of the 20th Century. This page was last modified on 1 May 2018, at 20:33.